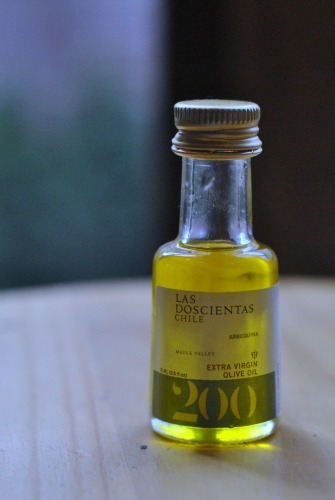 Two weeks ago, I posted a #CookChilean recipe idea challenge. I’d received a crate of foods from the Foods from Chile, and I asked you to come up with ideas for recipes created with some (or all) of the ingredients. You are some seriously creative people. I loved all the suggestions submitted but could not resist choosing Jean Layton‘s savory mussel lemon pie which used the lemons, the canned Chilean mussels, and the extra virgin olive oil. Genius and Delicious! She won her own delivery of Foods from Chile foods. I took Jean’s idea and modified it a bit to create it as more of a salad dip. We’ve been busy getting ready for our big trip to France and Italy the last week and have had no time for entertaining but plenty of time for picnicking. I loved the idea of combining the sweet mussels with the fruits from the crate, but there simply was no time for pie crust in our lives! I topped some potato chips with a little merlot jam and served them with a bowl of couscous studded with mussels, chunks of roasted clementines, apples, lemons, and added some dried cherries to boost color and sweetness. I drizzled olive oil and lemon juice on the couscous before serving, and we had a Mediterranean picnic salad that was a crowd pleaser. Next time I have some people over, Jean’s savory lemon mussel pie with an olive oil crust and her roasted clementine pie are on my must make list. You still have a chance to win one of your own bags of Foods from Chile goodies. I hope you’ll join me, and the other participating food bloggers for a #CookChilean Twitter party on Tuesday, August 6 from 7 to 8 PM EST. We’ll be talking about what makes Chile a special place and giving away more crates of delicious food. Pre-register for the Twitter Party on eventbrite to be eligible to win prizes. You’ll need a special clue for the Twitter party which just happens to be a fact about Foods from Chile. 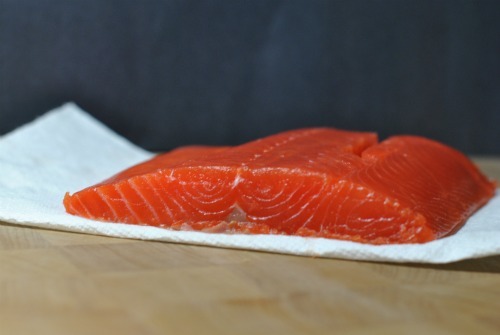 Did you know that 7 million people eat fresh chilean salmon every day? Pretty amazing right? And a pretty good fact to remember for Tuesday’s twitter party. Prepare the couscous according to package directions. 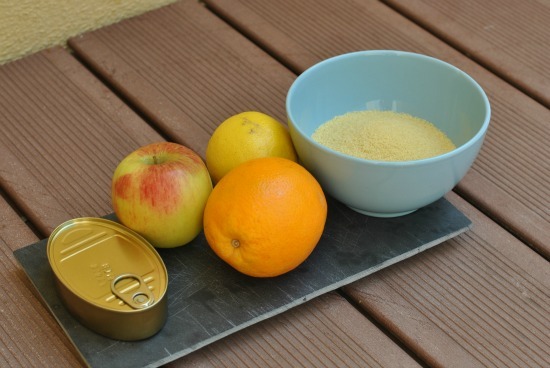 Peel and cut the clementines, lemon, and apples into ½ inch cubes. Toss with one tablespoon of olive oil and teaspoon of sugar. Roast at 425 degrees for 10 minutes. Take out of oven and set aside. In a pretty bowl, pour the cooked couscous. Toss in the roasted fruit. Add the dried cherries and the mussels. Drizzle with the olive oil and lemon juice. Toss. Taste. Add salt and pepper to your liking. Separately, take a package of chips or plain crackers. Smear jam on each. 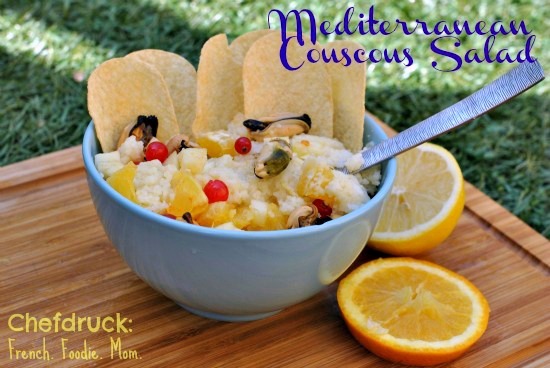 Serve with the bowl of couscous salad and a spoon to top each cracker.